Sat, Apr 20, 2019, 20:29:42 ---- The fact: 42.844.000 visitors done. Lebanon, OH, USA March 17, 2009 World-leading tube bending and endforming technology specialist, AddisonMckee, today announced an agreement to merge with Eagle Precision Technologies, a world leader in muffler manufacturing solutions. "This transaction will bring together the two largest global names in tube manipulation products and services," states Joe Eramo, Chief Executive Officer of AddisonMckee. "This merger will provide our collective global customer base with the absolute best in technical solutions from two innovative industry leaders, while lowering our product costs via the consolidation process underlining synergistic savings." Mr. Eramo further asserts, "In the current economic environment, market consolidations are a reality with fewer, but larger future customers. Our strategic approach is to be the leader in the consolidation arena, and, ultimately, to be best positioned as customer demand increases in the future." "We are convinced that AddisonMckee's commitment to innovation, speed-to-market, and exceptional manufacturing capabilities, will significantly benefit our customers around the world," states Dennis Hewko, President and CEO of Eagle Precision Technologies. "Much like Eagle, AddisonMckee has an enviable reputation for the quality of its bending, endforming, and tooling products, and an unquestionable willingness to provide the very finest in such solutions. 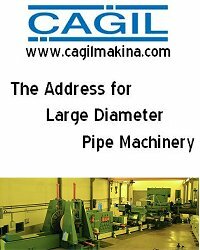 The combination of Eagle and AddisonMckee is extremely compelling as it will create a powerful leader in the tube manipulation industry, with an enhanced, complete products and services portfolio second to none." As a result of this transaction, the manufacturing of products for both AddisonMckee and Eagle brands will be consolidated into AddisonMckees facilities in Lebanon, Ohio, Brantford Ontario, Canada and Tianjin, China. The Eagle facilities in Brantford, Canada and Shanghai, China will close. This comes on the heels of AddisonMckees recent announcement of the closure of its United Kingdom facility. Key Eagle and AddisonMckee sales, engineering, parts, and field service personnel will be retained within the business and in strategic locations all in order to continue to offer the highest levels of support to which AddisonMckee and Eagle customers have grown accustomed. The resulting organization will continue to do business under the AddisonMckee name, while the valuable Eagle brand name will be retained for key products as part of the rationalization of both product lines. As part of the exclusive agreement, AddisonMckee will acquire defined assets of Eagle Precision Technologies, including designs, drawings, software and trademarks, while excluding its liabilities, facilities, and certain equipment. 2008 winners of Managing Automation magazine's Progressive Manufacturing 50 Awards a prestigious award based on an organizations ability to use information and automation technologies to transform its business and create a sustainable competitive advantage AddisonMckee is globally renowned for the design, manufacture and supply of some of the world's finest tube bending and end forming technologies - for increasingly complex automotive, aviation, truck and shipbuilding requirements. In addition, AddisonMckee also offers highly innovative muffler and catalytic converter assembly solutions, hydraulic press machinery, tube inspection systems, plant automation and complete workcell integration. In addition to these capabilities, a whole range of tooling and accessory options are also provided, as are comprehensive maintenance and service contracts, training and education programs and financial services. Where applicable, AddisonMckee is also able to offer customers the opportunity of machine rebuilds, refurbishment, upgrades and trade-ins. From its state-of-the-art manufacturing centers in the USA, Canada and China, AddisonMckee is committed to providing rapid solutions to market and also regularly assists clients in product prototyping, parts development, small production runs and pre-production sample development. AddisonMckee is principally owned by WHI Capital Partners (WHICP), a Chicago-based private equity group that invests in middle market, industry-leading companies with solid financial fundamentals and proven management teams. WHICP is an affiliate of William Harris Investors, Inc., a family-based asset management firm founded by Irving B. Harris in 1987. About Eagle Precision Technologies, Ltd.
Eagle Precision Technologies has been a world leader in the design and manufacture of tube forming solutions for over 45 years. Key markets served include the Automotive, Aerospace, Power Generation, HVAC and Shipbuilding industries. Eagle has created value for its customers by providing innovative solutions which maximize the quality and efficiency of their production. Eagle is the only brand which provides the full range of equipment necessary for the manufacture of complete automotive exhaust systems. Eagle built its first muffler machine, the SZ, in 1967. That same SZ series machine is still in use today around the world, 40 years after manufacture. Today, Eagle Precision Technologies is a world-leader in muffler assembly technologies, and the Eagle brand has become synonymous with the design and manufacture of the very highest quality muffler-related products. With a complete portfolio of automated machines for the production of muffler and catalytic converter components, Eagle has an installed base of more than 8,000 machines in over 60 countries.